I had help with my insourcing this week. And she did a grand job of walking the family pet, our little whippet, to boot. We learned much about each other, in shared companionship over the roses and racing around the local park. Christmas gift making is in full swing at Chez Mimi. You may recall my Be Fabulous heart mentioned here. Here's another I've worked in Chinese brocade offcuts, pink tulle, vintage ecru lace, and glittered flower petals. I've been finger painting too. Not with Granddaughter though. Just all on my lonesome. Sheets of butchers paper are roughly and quickly painted with acrylic paint in jewel and pastel tones, then ribbon effects created by swirling fingers through the wet paint. I peg these up on skirt hangers, allowing them to dry, before using them as gift wrap. 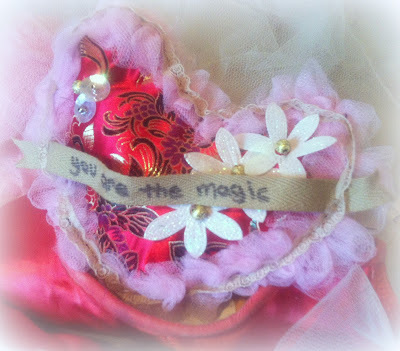 A trick I learned from Annabel over at The Bluebirds are Nesting in one of her many gorgeous posts on gift making here, is to wrap inexpensive soaps, and embellish them with lavish ribbon and rhinestone buckles. This one is for a dance teacher who adores that shade of teal/peacock green, and the wrap is one of my finger painted lengths of gift wrap. As you can see, the finger painting gives a really lovely sort of texture that almost looks quilted. Whilst my interpretation of 'the wrapped soap' is different to Annabels, I know that the person this is going to, will love it. She's a redhead, and teal, ecru and navy are her favourite colours. She'll love the varying textures of the paper, the velvet ribbon, the taupe tape, and the rhinestones. It all just begs you to touch and enjoy. I'll do a box of four for her. Remember when gift soaps came in little boxes of four? I'll do three more like this and box them the same way. Again, it's about taking the idea, and adapting to what the recipient likes. Another little bit of whimsy here, where I've made a nest from stiffened lace. I cut a circlet of organza, and trimmed it with wide white lace and ruffled blue tulle ribbon. I then fashioned a little yarn nest from some wool, soaked in the fabric stiffener and laid over an upside down glass to form the shape. 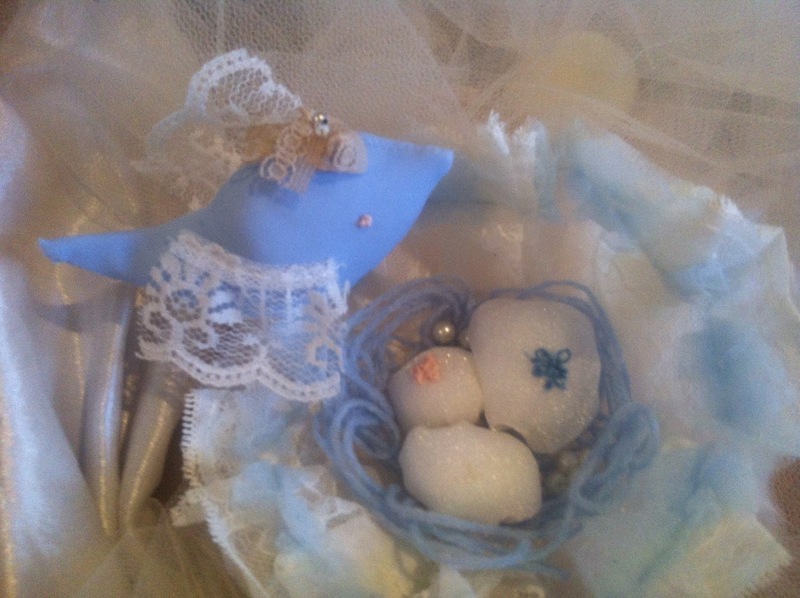 I nestled some hand embroidered organza eggs inside, interspersed some pearls, and fashioned a Mama Bird from matte pastel lycra and lace to watch over them. I even gave the birdie a little ecru Nanny cap on her sweet head. This one is a gift for another Grandmother I know, for her little granddaughter to play with. Financially, it's difficult to say what I've saved this week, but certainly I'm saving my sanity and my bank balance by creating my own gifts. It's so much fun to wake up with a project already on my mind, and to have the time to work when inspiration comes. 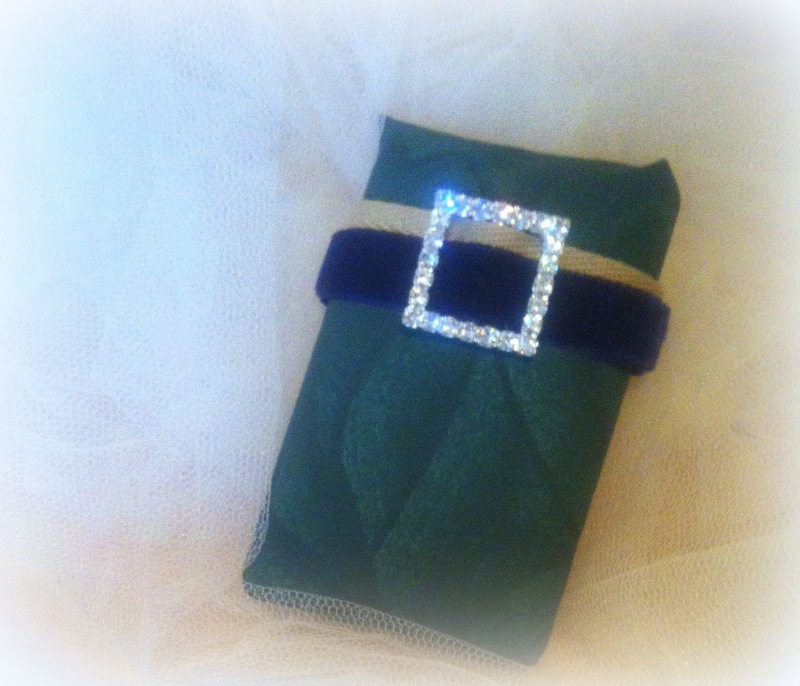 It is so wonderful that you are taking your time to create your own handmade gifts for Christmas. We love having you and look forward to seeing you again. Your helper is not only cute, she is definitely quite talented! Oh there are so many pretty whimsical whimsies in this post, Mimi. Gifts crafted from another's heart and hands are always so very special. Such a lovely photo of your granddaughter walking your Whippet. 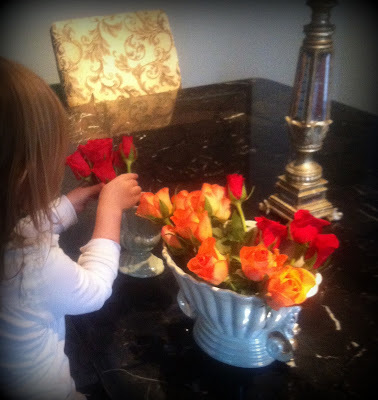 She has created a lovely floral arrangement....she is certainly a talented little florist! Lovely gifts, Mimi. I am sure they will be much appreciated. 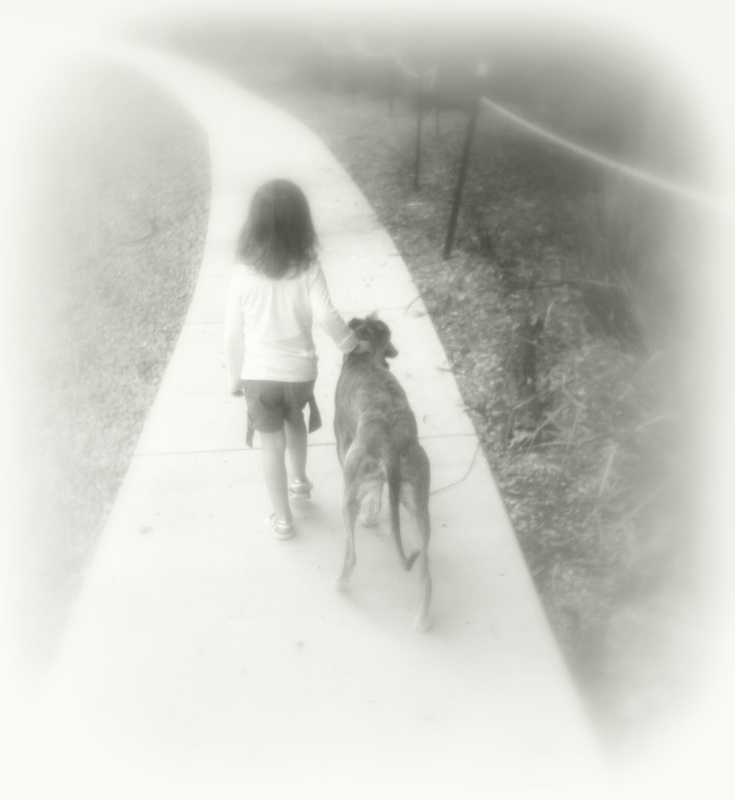 I love that photo of your granddaughter walking the doggie. So many gorgeous gifts Mimi, and your granddaughter is gorgeous too! Love the walking the dog photo, looks great in black and white. Thanks for joining Roses of Inspiration. Hugs to you!